This project involved the complete refurbishment and remodelling of an existing detached house including new rooftop, front and rear extensions and new landscaping to create a light and bright contemporary home. A new enlarged canopied entrance leads into the remodelled open plan ground floor living, kitchen and dining areas and provides views through to the stone paved terrace and new timber decked swimming pool surround within the south facing rear garden that incorporate a new pool house pavilion structure. The existing garage has been converted into a new bedroom with ensuite shower room and study area suitable for a nanny. 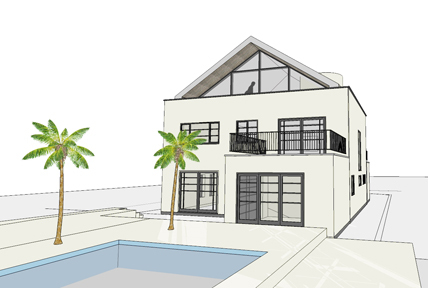 The new rear extension enlarges the open plan kitchen and dining areas and incorporates new fully glazed screens that allow direct access to the terrace and pool areas. A new oak staircase leads up to the refurbished bedrooms, bathrooms and master bedroom suite with ensuite shower room and walk-in wardrobe. The pared down contemporary aesthetic employs a simple detailing and finishes palette including white external rendered walls; hardwood floors, cladding and decking; ppc metalwork, glazed doors and windows. The proposed next phase of works will create a new lightweight single storey second floor contemporary extension to replace the existing tiled pitched roof. It will incorporate a circular double glazed skylight above the main staircase that will allow natural light to penetrate down into the plan and create a dramatic new feature. It will provide a new habitable space comprising reception space, shower/ wc, small kitchenette/ bar and feature fireplace and a new south facing external timber decked balcony area with direct access down to the landscaped rear garden and swimming pool via a new external stair.